Item #803 Polar Lights/Round 2 Star Trek Classic U.S.S. Enterprise Snap-Together Model Kit $18.95 ea. In Stock (HAS BEEN DISCONTINUED BY POLAR LIGHTS) This new re-issue is sealed, Polar Lights first new re-issue classic U.S.S. Enterpirse NCC-1701 snap together kit has 50 pieces, is a skill level 2, all plastic model, when assembled is about 11 1/2" long, 1/1,000 scale, in each kit you can make 1 of 3 different version of the Enterprise, standard series version, 1st. pilot version and 2nd. pilot version, also includes decals & instructions, paint & glue Not included. This out of production Amt/Ertl 25th. Anniversary Edition kit, is still sealed, includes 3 completly detailed Starships in constant 1/2500 scale, 3 plaques with Starship data decals, original U.S.S. Enterprise (4 1/2 " long), U.S.S. Enterprise re-fit (movie version 4 4 3/16" long) and U.S.S. Enterprise D from Next Generation version (10" long), overall length of kit when assembled is over 15 1/2" long, all 3 ships are chrome toned plated, complete full color decals and display stand included, box is in good condition, paint & glue NOT included. Item #AMT843 Star Trek-U.S.S. Excelsior Snap-Together Ship Model Kit $39.95 ea. In Stock This new tooled Snap-Together 1:1,000 scale, Excelsior kit, all boxes are near mint & sealed, parts to build either the NX-2000 or NCC-2000, is extremely detailed, skill level 2, comes with a domed display base with metal support rod, decal sheet, 50th. Anniversary edition, paint & glue Not included. Item #AMT695 Classic Star Trek U.S.S. Enterprise NCC-1701 Glow in Dark Tholian Web Edition Model Kit $34.95 ea. In Stock (HAS BEEN DISCONTINUED BY ROUND 2) This kit of the U.S.S. Enterprise NCC-1701-"Tholian Web" edition comes with the classic Enterprise ship and a Tholian web cardboard background, the starship comes in Glow in the Dark, when assembled is about 18" long, 2 Tholian Web spinner ships, is in 1/650th. scale, skill level 2, decals to make the Defiant, Enterprise or other ships, all boxes are near mint & sealed, paint & glue Not included. Item #807 Polar Lights Re-issue Enterprise NX-01 Snap-Together Model Kit $18.95 ea. In Stock (HAS BEEN DISCONTINUED BY POLAR LIGHTS) This new re-issue Polar Lights Enterprise NX-01 snap-together model kit is in 1:1,000 scale, still sealed, near mint box, skill level 2, 35 pieces, when assembled is about 9" long, comes with display stand, decals & instruction sheet, paint & glue Not included. Item #1084 AMT/R2 Star Trek-Deep Space Nine- Rio Grande Shuttle Craft Re-Issue Model Kit $39.95 In Stock (ONLY HAVE 1) This Rio-Grande Deep Space Nine Shuttle Craft model kit hasn't been available for over 20 yrs. Kit is in 1:72nd. scale, when assembled is about 12 1/2" long, extremely detailed, 42 parts, optional sensor cluster, alternate ship registrations include U.S.S. Rio Grande, U.S.S. Ganges & U.S.S. Yangtzeee Kiang, also includes decal sheet, display base, all boxes are near mint & sealed, skill level 2, paint & glue Not included. Item #806 Polar Lights Re-issue Classic Star Trek Klingon D-7 Battlecruiser Snap-Together Model Kit $18.95 ea. In Stock (HAS BEEN DISCONTINUED BY POLAR LIGHTS) In 1:1,000 scale, this new re-issue Polar Lights classic Klingon D-7 Battlecruiser is still sealed in a near mint box, includes over 35 parts, decal sheet, instuctions, when assembled is about 10" long & includes display stand, paint & glue Not included. Item #AMT609 Amt U.S.S. Enterprise re-issue Model Kit in Tin Box $39.95 ea. In Stock (HAS BEEN DISCONTINUED BY AMT) This first time ever that any Star Trek model kit has been packaged in a embossed tin box, limited edition only 1,701 made, comes with decals, instruction sheet, when assembled is about 18" long, in 1/650th. scale, has same art work as original version also comes with a bonus art print, all tins are near mint and still sealed, skill level 2, paint & glue Not included. Item #AMT610 Amt Classic Star Trek-U.S.S. Enterprise Re-Issue Model Kit $24.95 ea. In Stock (HAS BEEN DISCONTINUED BY AMT/ROUND 2) These New Amt re-issue model kits are sealed and are in near mint boxes, first time ever re-issued in over 40 yrs. same box art as the original Amt kit, comes with decals, instruction sheet, display base, when assembled is almost 18" long, 1/650th. scale, limited edition, paint & glue Not included, skill level 2. 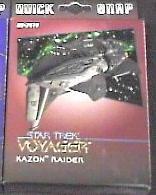 This 1995 out of production Revell/Monogram snap together model kit of the Kazon ship as seen in Star Trek-Voyager tv series, skill level 1, is still mint in a near mint box and are about 2" to 3" in length, they are pre-painted, no glue is needed, paint & glue NOT included.